People, I kid you not, the past two days in New York have been miserable, disgusting and infernally hot. Hair-matted-to-the-back-of-my-neck, sweat-trickling-down-uncomfortable-parts-of-my-body, clothes-clinging-in-unflattering-ways, face-shining-like-I-dipped-it-in-olive-oil kind of weather. Not kidding. I wanted to die. And it’s not even summer yet! The official change of seasons is still more than a week away, and I’m already itching for it to be over (literally, this heat makes me itchy…and bitchy). 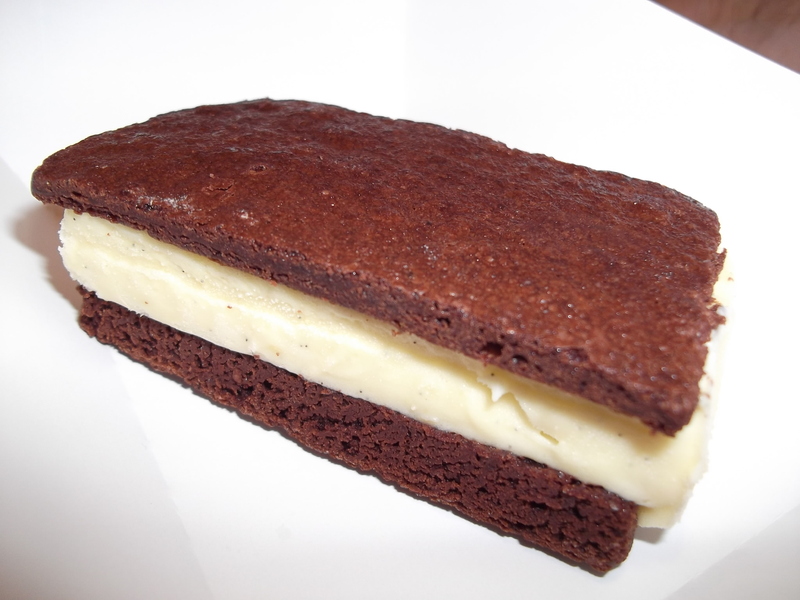 To cope with the nasty weather I turned to a reliable cooling treat: ice cream sandwiches. Because I was in SoHo, where I now work, I hopped on over to nearby Francois Payard. I’d never been to the cute little patisserie before but when I read in a recent NYmag.com feature that they had some tasty little ice cream sandwiches, I was sold sold SOLD. Instead of regular cookies, Payard, known for their fancy french pastries, uses rectangular cut macarons. Flaneur, who I asked to meet me (since an ice cream sandwich would never have survived the walk home), went the classic route and got the vanilla bean ice cream and chewy brownie combo, while I went with the slightly more tropical themed coconut and mango sorbet between coconut macarons. Flaneur’s was good, the creamy cold vanilla ice cream perfectly complementing the chewy chocolate brownie, but mine was exactly what I needed to pause my heat-related bitching. The macarons were subtle in flavor and had the classic, crispy airiness they’re known for while the fruity, frosty sorbet was refreshing and sweet. Summer might not technically be here yet, but when it shows up, I’ll be ready— with ice cream sandwich in hand. 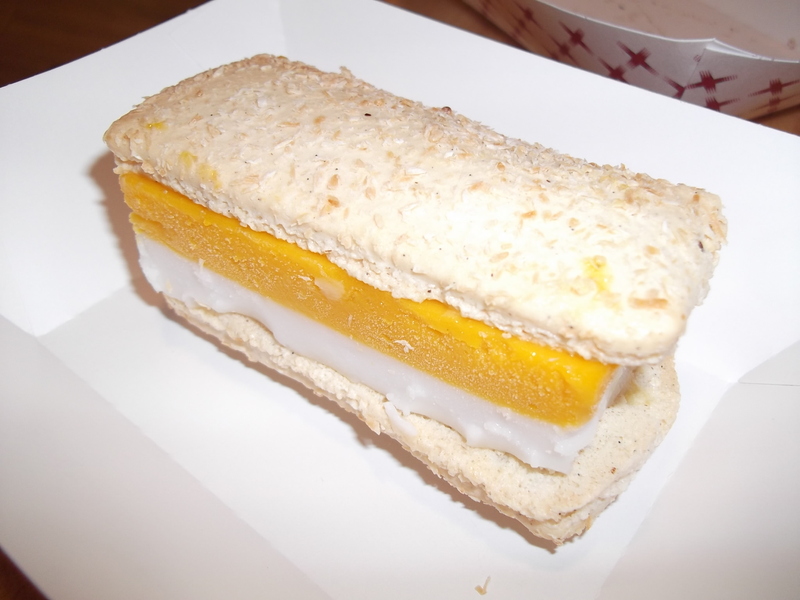 This entry was posted in Sweet stuff and tagged brownies, coconut, Francois Payard, ice cream, ice cream sandwich, macarons, mango. Bookmark the permalink.